This beautifully appointed custom-built home is located in sought after Shell Beach. 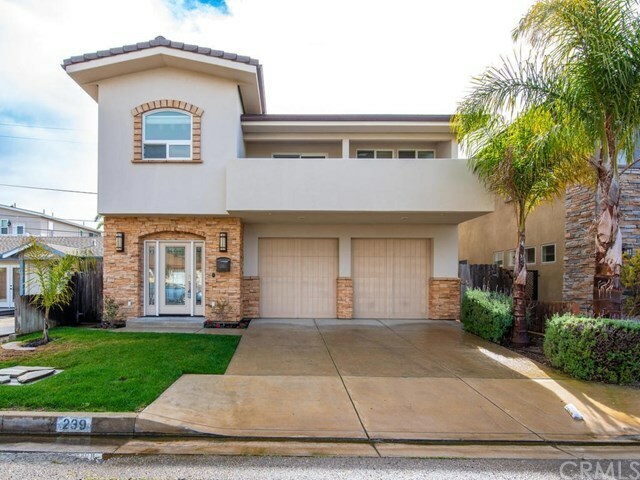 Only one block from the beach, this stunning 3 BR/2.5 bath home with upgraded features through out includes vaulted ceilings, surround sound system, two balconies, and a sought after roof-top deck overlooking Shell Beach. Located on the first floor are 2 bedrooms, a full bath, laundry room, and a bonus room just perfect for an office. The main floor of the home features an open floor plan with natural light provided by the many windows and skylights. Gourmet kitchen with upgraded built-in Viking appliances, lots of cabinets and counter space, and a breakfast bar which opens up to a cozy dining room and spacious living room with a stone fireplace and an outdoor patio. The spacious master suite is on this same floor and features a large walk-in closet, huge shower, granite counter tops, and balcony. The rooftop deck is accessible off the master suite or living room with views of the coastline, surrounding hillsides, and amazing sunsets. This beautiful custom home was designed for entertaining and relaxing with family and friends. Enjoy everything this upscale home has to offer all within close proximity to vineyards, beaches, and everything in between.